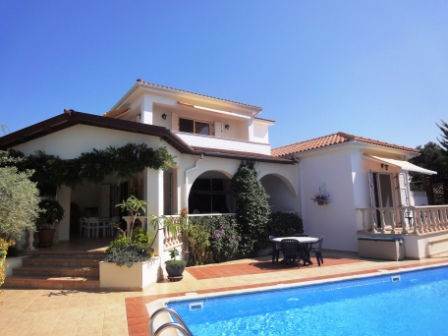 Cyprus Property Blog by Cleo : Villa in Sea Caves with Title Deeds - NOW SOLD! • 190 sq. m., 4 bath, 3 bdrm 2 story - €725,000 EUR - Title Deeds - Now Sold! Sea Caves, Paphos, Cyprus - This spacious 3 bedroom detached villa is located in the desirable Sea Caves neighbourhood. It is just a few minutes drive from Agios Georgios Beach (St. George), close to Coral Bay and the Akamas Peninsula. The custom built villa has every comfort of home plus fantastic sea views. The home itself is set back from the road and you drive onto your on private drive that is lined with mature trees and shrubs. Upon entering the foyer, you will see the spacious open plan living area with an archway to the left leading to the open fitted study area that is cleverly built-in under the marble, spiral staircase. A small lobby area to the right leads you to the guest WC and one of the en-suite bedrooms that is conveniently located on the first floor. To the front of the villa there is the living area which is well laid out and spacious with dual aspect sliding patio doors that lead to the large covered veranda, pool, gardens and lovely sea view. The kitchen is separated from the living room by a useful breakfast bar. In the adjoining utility room there is additional storage and washing machine. From here there is access to the barbecue area. Through a small lobby area you will find the other double bedroom that is on the ground floor and features an en-suite bathroom also. This bedroom is very similar to the first room with built-in wardrobes, sliding patio doors providing access to the balcony and an en-suite shower room. Upstairs is dedicated to the master suite which is very spacious and features a vaulted ceiling, walk-in closet with floor to ceiling shelving and hanging rails and sliding patio doors leading onto the terrace providing magnificent views over the Paphos coastline. The owners thought of every comfort when they designed this villa ensuring it was useful and functional from inside and out. This villa is perfect for a retirement home, family home or place to holiday with friends and family.